Automated Firewood specializes in machinery for firewood professionals & farmers. Our machinery is built with commercial firewood producers & farmers in mind. We offer a full line of firewood equipment including conveyors, firewood processors, bundlers, log splitters & skid steer attachments such as log grapples & brush grapples. We've been in the logging & firewood industry for nearly 20 years and have the experience to help you choose the correct machinery for your job. Contact us today and let us help you find the right equipment for your application. Our knowledgeable & friendly staff are eager to help in any way we can. The Automated Firewood conveyor is available in 16’, 24’ & 32’, or custom lengths per your requirements. Conveyors come standard with a 20” wide smooth rubber belt. Many options are available as well as delivery right to your job site. Our conveyors are built to handle the rigors of everyday firewood production, or for use in the demanding environment of a farm or ranch for use with hay or silage. Call us today, or follow the link below. See more details on our line of conveyors. Firewood processors by Brute Force Manufacturing. 4 models available with gas or diesel power. All Brute Force firewood processors are built with the commercial firewood producer in mind. From our entry level model 14-24 to the "Big Wood" model 24-30 HD we have a processor for most anyone who needs to cut & split large quantities of firewood. See the entire line of Brute Force firewood processors at www.BruteForceMfg.com. Firewood Bundlers by Brute Force Manufacturing. 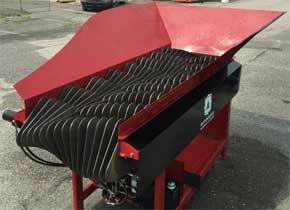 These sturdy firewood bundlers are made in Wisconsin & come standard with a 110v commercial electric motor, operated by a foot pedal. Bundle firewood up to 16" long & up to 1 cubic foot bundles. These machines are designed with the commercial firewood producer in mind and are built heavy duty to give a long service life. See more pictures & videos of this machine in operation. We offer 2 different log splitters designed for commercial firewood producers. Both of these splitters are built for firewood professionals and are great machines for high production firewood operations. Both of these machines & are built to split firewood on a daily basis. Whether you go with the Brute Force, or the Automated Auto-Split, we're confident that you will be splitting more firewood in less time. More info, pictures & video on these log splitter here. The Valby line of grapples are a great choice for skid steers, tractors, excavators & log loader applications. We also offer several sizes of log grapples, see our grapple page for more information on our line of Valby grapples. In addition to grapples, we also offer other Valby products including 3 pt hitch skidding grapples, wood chippers and log loader trailers, as well as Farmi skidding winches for farm tractors.